Marie P. Hodo, a food services attendant in Emory Dining, poses with Emory President James Wagner as she is honored for 45 years of service to the University. A total of 135 employees were recognized at the April 25 luncheon for reaching milestones in their years of service. 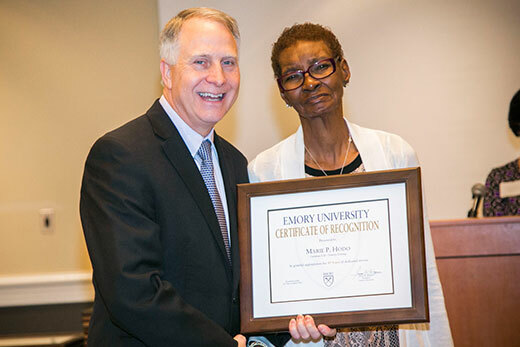 Emory University employees reaching milestones for years of service were honored at a recent luncheon with President James Wagner. The April 25 event celebrated two employees for achieving 45 years of service, three for 40 years of service, 16 for 35 years of service, 42 for 30 years of service and 72 for 25 years of service.